Micro-cylindrical lenses became more and more important for optical applications during the last years. Examples are the beam shaping of diode laser bars or the possibility to realize anamorphotic imaging by cylindrical systems. Thereby, a high surface quality of the lenses is required. While the fabrication process for cylindrical systems is very well developed, the measurement techniques still have to be improved. the numerical aperture of the lenses can be as high as 0.8. In this paper we describe two methods for the measurement of the lens quality both relying on diffractive optical elements (DOE). The optical performance of the lenses is tested in transmitted light at or very close to the design wavelength by means of a Mach-Zehnder interferometer. The surface shape, or better the deviations of the surface from its designed shape, is measured with the help of grazing incidence interferometry. To obtain a sufficiently high accuracy, both methods are performed in a null-test configuration with DOE acting as the compensating optics. The two methods, some arising design problems and experimental results are described in the following sections. In principle there are two different possibilities to measure the surface quality of cylindrical lenses with a null-test configuration: normal incidence interferometry and grazing incidence interferometry. In setups with normal incidence onto the surface under test the DOE is used to convert the incoming plane (or spherical) wavefront into a wavefront with light rays perpendicular to the surface. The reflected wavefront carrying the information about small deviations from the ideal shape of the surface is retransformed into a nearly plane (or spherical) wave by the second DOE (here we use an incoming plane wave because a spherical wave requires additional condensor optics and therefore means additional costs and alignment problems). This wave is superimposed by a plane reference wave to show the deviations as an interference pattern. For high aperture lenses the wavefront shaping may require rather high spatial frequencies in the DOE-structure, which are difficult to fabricate. An alternative solution for testing cylindrical surfaces is the use of grazing incidence interferometry. Here the function of beam splitting and beam combining can be distributed among two identical DOE. The obvious advantage becomes clear from the scheme of Fig. 1. Fig 1: Scheme of the grazing incidence interferometer for testing rod shaped objects (cylindrical lenses are a special case). The He-Ne-laser light is expanded by means of a microscope objective (MO) and an astronomical achromat (AO). The DOE 1,2 perform the beam shaping and splitting. The interference pattern is detected by a CCD-array. The first DOE can be moved axially to provide the necessary phase variations for phase shifting interferometry (PSI). Fig 2: Section through a rod of arbitrary cross section in a parameter representation with the curve length parameter t, the normal vector , and the displacement vector Solid line: perfectly aligned rod, shaded line: misaligned rod. the two optical active surfaces of a cylinder lens can be measured simultaneously. After the phase shift evaluation the measured phase distribution has to be freed from the contribution of the misadjustment of the cylinder lens in the interferometric setup in order to obtain the relevant deviations of the lens element from the ideal form. Therefore, an ansatz for the contribution due to the misalignment has to be made to enable a least-squares-fitting procedure. 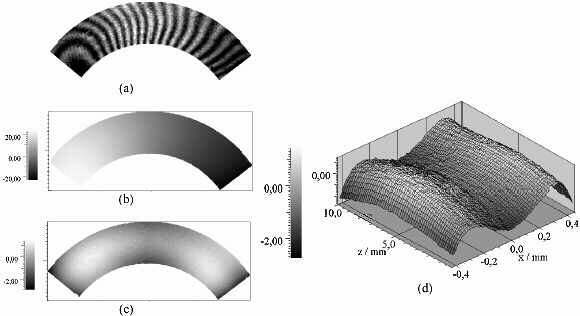 A measurement result of a micro-cylinder lens in grazing incidence is shown in Fig. 3. Since the effective wavelength is equal to the pitch p of the DOEs the deviation data are scaled in units of p/2 because of the reflected light arrangement. In the present case the pitch is 5mm so one period in the interferogram corresponds to 2.5mm surface deviation. With the phase shifting technique usually 1/100 of the period can be measured, so the resulting accuracy is about 0.025mm, which is sufficient for the testing of beam shaping lenses for infrared light sources (ca. 800nm which corresponds to a repeatability of about l/30). (3a) interference pattern with noticeable misadjustment in x-direction. (3b) Unwrapped phase map containing the adjustment errors and the surface information (P-V value about 40mm). (3c) Remaining surface deviations after the subtraction of the misalignment errors. (3d) Measurement result in pseudo-3d view. Surface deviations in units of 1mm. z corresponds to the length and x corresponds to the width of the lens. For measuring the wave aberrations, i.e. the optical performance, of lenses with high numerical aperture in transmitted light we built a fiberoptical Mach-Zehnder-Interferometer. Fig. 4 shows the setup: A polarizing beamsplitter (PBS) divides the polarized light of a 40 mW laserdiode (780nm) into two polarization maintaining fibers. The cylindrical lens is illuminated by collimated light and generates a diverging cylindrical wave, which passes through the diffractive optical element (DOE). Using the first diffraction order of the DOE the cylindrical wave is compensated and a nearly plane wave carrying the aberrations of the lens is formed. Afterwards the wave is combined via a beamsplitter with the reference wave onto the CCD-Chip. The interferograms are evaluated with common phase-shifting techniques. As in the preceding chapter we use a null-test configuration: The DOE is illuminated by the diverging cylindrical wave of the microlens and acts as a null-corrector by collimating this wave again into a plane wave. The emerging wave ideally shows only the wave aberrations of the lens. In this way, we can measure lenses with a NA of about 0.8. The manufacturing process demands high requirements, since the smallest arising stuctures in the DOE are in the range of 500nm. This is done by e-beam lithographie at the Heinrich-Hertz-Institut für Nachrichtentechnik. Fig 4: Setup of the Mach-Zehnder interferometer. The second function of the DOE is the anamorphotic optical transformation of the cylindrical lens. The distance between DOE and microlens and the lateral dimension of the DOE is chosen such, that the arising image is adjusted to the size and the aspect ratio of the CCDChip. In this way a whole lens with an aspect-ratio of 1:10 can be imaged on a usual CCDChip with an aspect ratio of about 1:1. After fitting the coefficients of the polynomial to the unwrapped phase (least square fit) we can subtract the misalignment aberrations from the measurement. 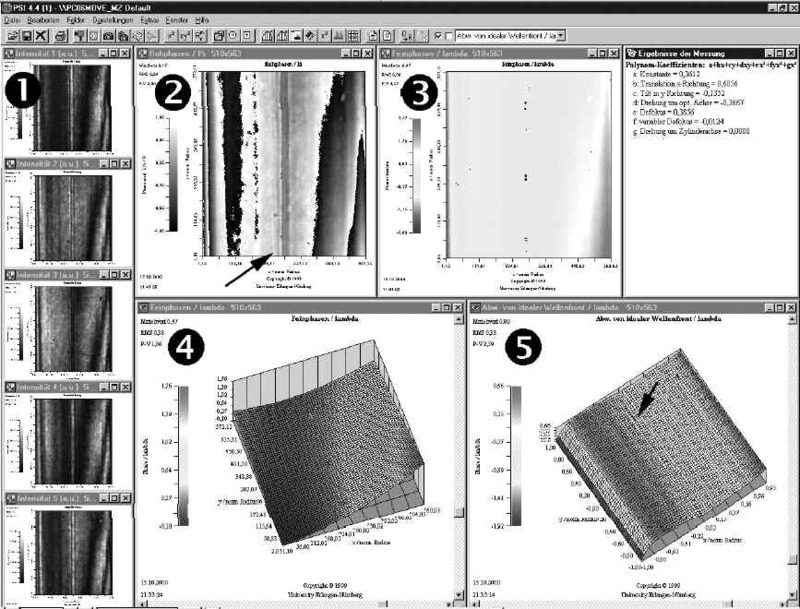 Fig 5: Appearance of a measurement in the phase shift software PSI: (1) the 5 intensity patterns, (2) raw phase with the arrow indicating defects in the vertex of the lens , (3) unwrapped phase, (4) unwrapped phase 3D, and (5) wave aberrations freed from misalignment terms with the arrow indicating defects in the vertex. Fig. 5 illustrates a complete run of the software. In this illustration one can see defects in the vertex of the lens (indicated by the arrows in section (2) and (5) of Fig. 5). They are caused by the undesirable 0th diffraction-order of the DOE. To avoide these disturbances, we designed DOEs in which we superimpose a plane wave with a small angle perpendicular to the cylindrical axis. By it the 0th and 1st diffraction order can be completely spatialy separated in the Fourier-plane, and the disturbances can be removed by filtering with a diaphragm. As one can see in the raytrace-simulation (Fig 6) the diagonally propagating 1st diffraction order is moving parallel to the optical axis after passing a wedge prism with a proper wedge angle. The high sensitivity of diffractive optical elements against wavelength-mismatch is another point of interest. Disturbing aberrations appear if the illumination wavelength differs from the design wavelength of the DOE. For example a deviation of only 1 nm results in aberrations in the range of l/4 with high-aperture DOEs. Therefore, a stabilised laser has to be used.